With convenient prayer facilities, delicious halal cuisine and historic sites to explore, Bintan is a must-visit. Head to Plaza Lagoi for commercial, leisure, and recreational activities on Bintan island. Think Muslim-friendly destinations and Middle Eastern countries inevitably come to mind. 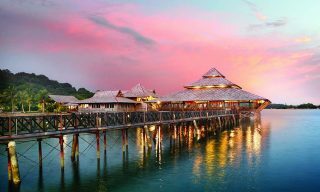 However, Bintan, the largest island of Indonesia’s Riau Archipelago, is a choice destination if you’re eyeing the perfect tropical island getaway. 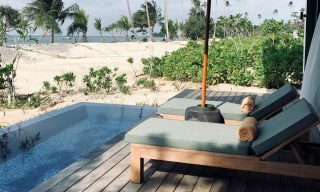 With the Muslim travel segment being one of the world’s fastest-growing tourism sectors, the resorts on the island have upped the ante when it comes to easing these travelers’ needs. Guests can enjoy a comfortable stay in the many Muslim-friendly accommodations of Bintan Resorts such as Nirwana Gardens, Angsana Bintan, and Grand Lagoi Hotel, located along the idyllic northern coastline of Bintan Island. To cater to faith-based needs such as their five daily prayers, most resorts offer thoughtful indications of the kiblah direction in well-furnished rooms. Prayer rooms can also be easily accessed in Bintan Resorts’ public areas, including Chill Cove @ Treasure Bay Bintan and Plaza Lagoi. Travelers looking to pray in a mosque during their travels can visit the Al Muhajirin mosque, which is the largest mosque in Bintan Resorts and holds up to 1,500 people. Nestled around lush trees, the Javanese-style, mosque emanates a tranquil ambience, allowing one to be close to nature and God during prayer. Conveniently-located prayer facilities, along with exciting activities and exclusive facilities in the resorts, will guarantee guests a good time with their loved ones. The delicious Ayam Penyat from Warung Yeah! is a must-try. Halal food, being one of the key services that Muslim travelers consider to be of importance, is readily available at Bintan Resorts. To satiate appetites, make a beeline for Spice Restaurant at Nirwana Gardens, which serves aromatic, vegetarian Indian dishes. 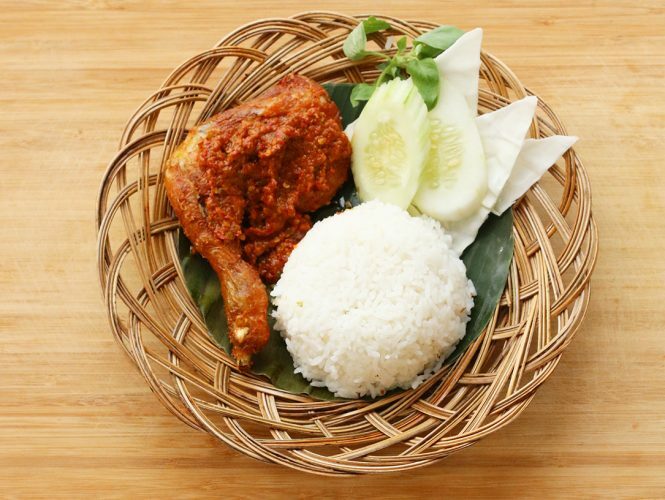 Those who fancy a taste of authentic local food like Nasi Padang will be spoilt for choice by the variety of dishes available at Lamak Basamo (Plaza Lagoi) or even Pujasera, the township hawker center. Warung Yeah!, on the other hand, is a wonderful choice for those with adventurous appetites, as it serves Indonesian cuisine with a twist. Here, you’ll find interesting menu items like Indomie Pizza. If you’re craving for seafood, Idola Café & Resto at Plaza Lagoi serves a flavorful gonggong (sea snail) dish, a local specialty, among other delectable seafood. Guests are also encouraged to venture out on a day tour to the local towns, where plenty of halal food options are available. Penyengat Island, a small island rich in culture and heritage, is reachable by a 10-minute boat ride from the capital, Tanjung Pinang. Not only is Bintan a Muslim-friendly island, it also plays a crucial role in the illustrious history of Indonesian Islamic civilization. 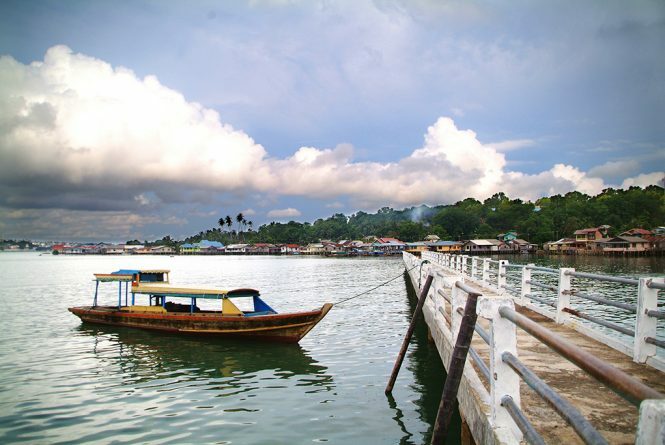 One of the more well-known sites is Penyengat Island, a small island rich in culture and heritage, reachable by a 10-minute boat ride from the capital, Tanjung Pinang. Before the formal abolishment of the Riau Sultanate in 1911 by the Dutch, Penyengat Island had been an important part of the region. To truly discover the 2km island, visitors can hop on a becak (motorized trishaw) for a historical tour, where they’ll be able to explore old palace ruins and be enthralled by the stories of significant figures and past rulers. Along the way, don’t forget to stop by the tomb of Raja Ali Haji, who is the first non-military hero in Indonesia. The 19th-century poet scholar was known to lay the basics of Malay language in a standard textbook titled Pedoman Bahasa (The Malay Language Guidance). In 1874, he wrote Gurindam Dua Belas, a famous Malay poem, presenting a new wave of literature during its time. After which, continue your journey to another national hero’s tomb. Raja Haji Fisabilillah, of whom the local airport was named after, had been a Viceroy of the Johor-Riau Empire and a Bugis warrior who led successful raids against the Dutch and eventually died in one of his attempts. 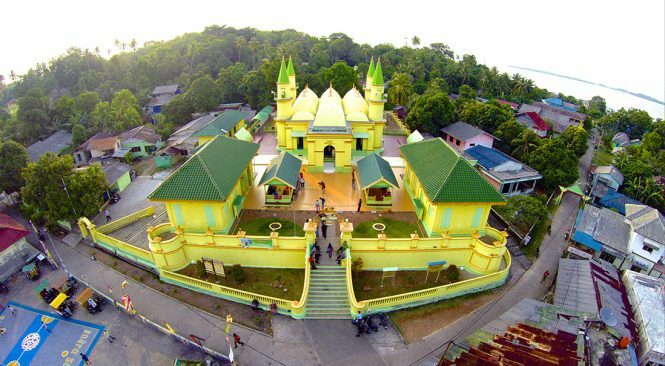 Sultan of Riau’s Grand Mosque is the jewel of the island with its bright yellow and unique facade. The crown jewel of the island has to be The Sultan of Riau’s Grand Mosque, with its striking yellow and green facade. An interesting fact? The bonding agent of this sturdy structure is said to be egg whites gifted by the Sultan’s loyal subjects during his wedding. Clad in white, the mosque features an arched ceiling, decorated with an antique Germany-made chandelier, a gift older than the mosque itself. Underneath it, you can find a well-preserved Koran, handwritten in 1867 by Abdurrahman Stambul, a local who received a grant from Lingga Sultanate to study in Egypt. Back on the main island of Bintan, another mosque stands majestically with vibrant hues and gigantic domes. Clothed in a bright shade of pink, the Grand Mosque An-Nur Kawal has grown to be a new Islamic architectural icon of Bintan. Drop by to pray or snap a photo with it for memory sake; it is located merely a few minutes’ drive from Trikora Beach. 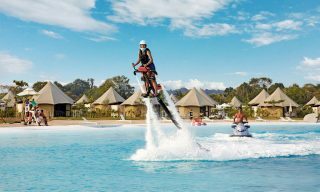 Apart from the above-mentioned, Bintan Resorts and the rest of the island has plenty to offer in terms of Muslim-friendly accommodation, recreational facilities, spas, and activities. 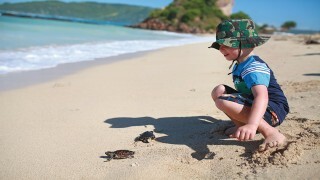 Travelers with a penchant for nature spots, shopping or even golf, will be spoilt for choice by the attractions on the island. 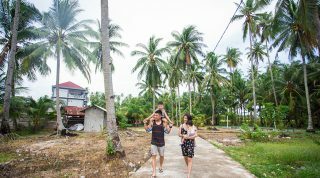 Merely an hour’s ferry ride from Singapore, Bintan makes an ideal destination for Muslim travelers from all over the world. Bird’s eye view of Angsana Bintan. To ease the worries of Muslim travelers visiting Bintan for the very first time, Bintan Resorts has partnered with CrescentRating, a leading authority on Halal-friendly travel, and Halaltrip, an online travel website specializing in halal and family-friendly travel to roll out a series of initiatives. Establishments have been rated based on the CrescentRating’s rating system for Muslim friendliness. For more insights, download the Muslim Visitor Guide to Bintan Resorts here. This free guide is available in English, Chinese, and Arabic. For more information, visit the dedicated microsite on HalalTrip, which has been developed to showcase halal-friendly options, as well as to share the wonderful experiences of social influencers from the Muslim community. This article was brought to you by Bintan Resorts. Kid-friendly? Check. Fun for the whole family? Check.